Get your business noticed at upcoming exhibition and promotional events with completely custom-built pop up exhibition stands. We are expert in designing stands ideal for indoor and outdoor displays at retail areas, trade shows and your own workplace. Our exceptional and creative exhibition stand designs quickly get noticed and engaging content seizes the attention of the audience to convey your message effectively. 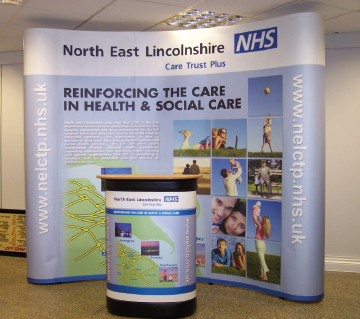 Pop up exhibition display stands are basically available in three types and designs. Anti-scratch and resistant to harsh weather conditions. You can also upload if have your own artwork. Our exhibition stands start from £595 with. Get the best art work done today and market your brand efficiently! Be the first to review “Exhibition Stands” Click here to cancel reply.